Shri Tulsiram Silawat was born on 05 November 1954 at Pivdai village of Indore district. Son of Late Shri Thakurdin Silawat, Shri Tulsiram is an MA in Political Science. He is an agriculturist. Shri Silawat has special interest in social service. Shri Silawat was the President of the Students Union of Government Arts and Commerce College, Indore in the year 1977-78 and 1978-79. He was also the Students Union president of Devi Ahilya University, Indore in 1978-79 and 1980-81. 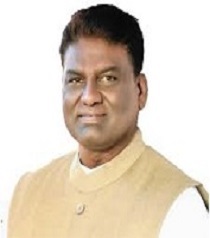 Shri Silawat became the Corporator of Indore Municipal Corporation in 1982. He was elected Member of the 8th Legislative Assembly in 1985 and was a Parliamentary Secretary. In 1995, he became the National Vice President of Nehru Yuva Kendra. He was the Chairman of Madhya Pradesh Urja Vikas Nigam from 1998 to 2003. Shri Silawat was also the member of Akhil Bharatiya Congress Committee and Vice-President of the State Congress Committee. Shri Silawat was elected Member of the 12th Legislative Assembly in the by-election of December 2007. He was elected member of the Assembly for the third time in the year 2008. He was elected member of the Assembly for the 4th time from Sanwer in the yaer 2018. Shri Tulsiram Silawat took oath as Cabinet Minister in the Council of Ministers of Chief Minister Shri Kamal Nath on December 25, 2018. Copyright hamariladli.org 2012. All rights Reserved.